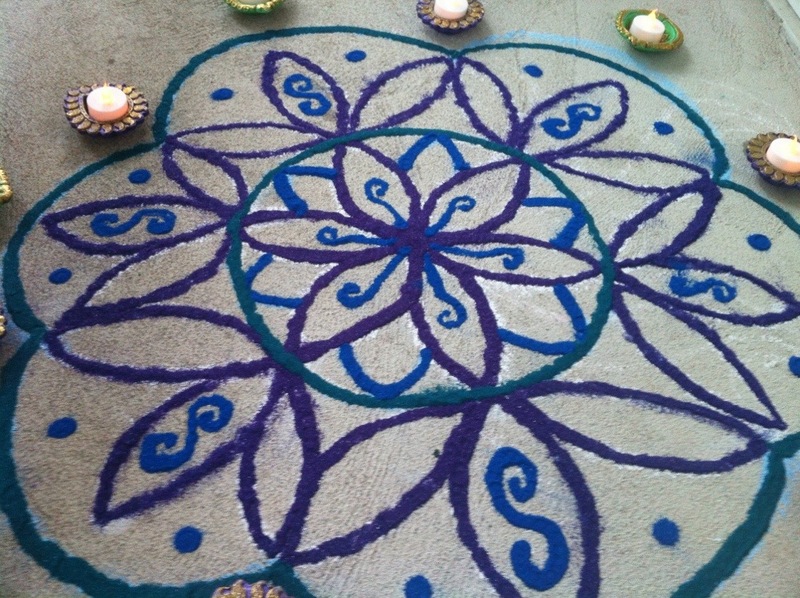 This is my rangoli for this year. 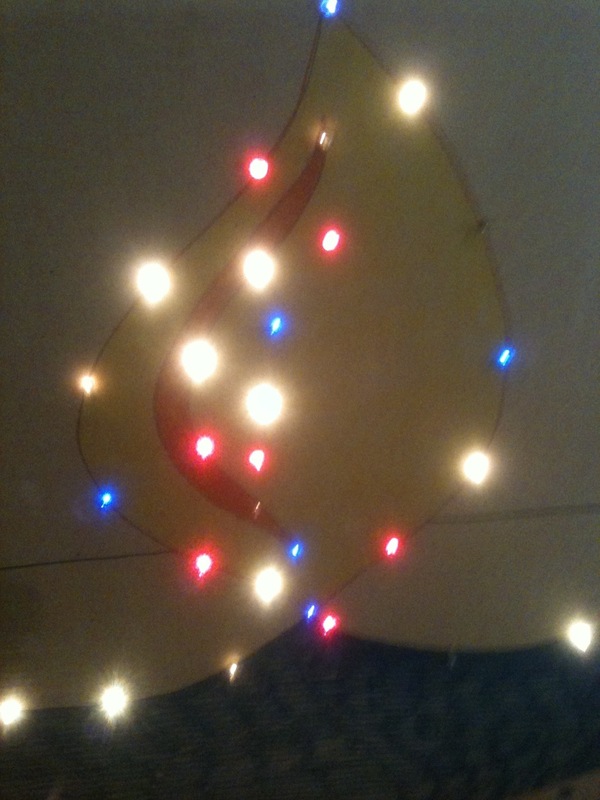 It is again somewhat contemporary and different. 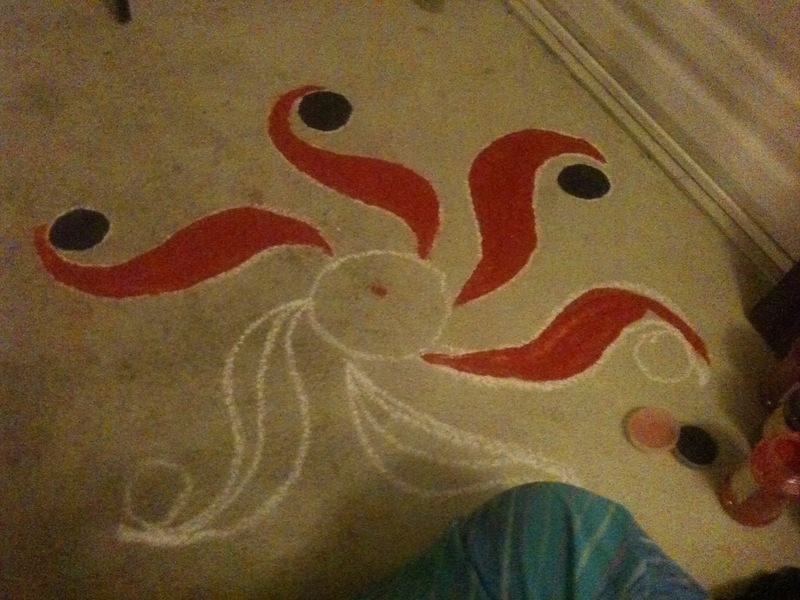 I used chalk to make my outlines and then covered with the colored powders and added small detailing. 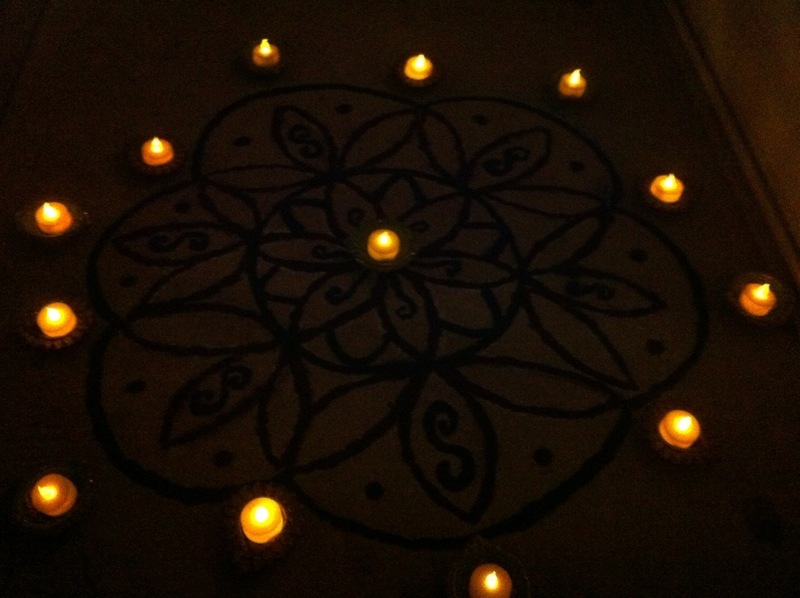 For the diyas I did not use oil, instead I use battery operated tea lights. 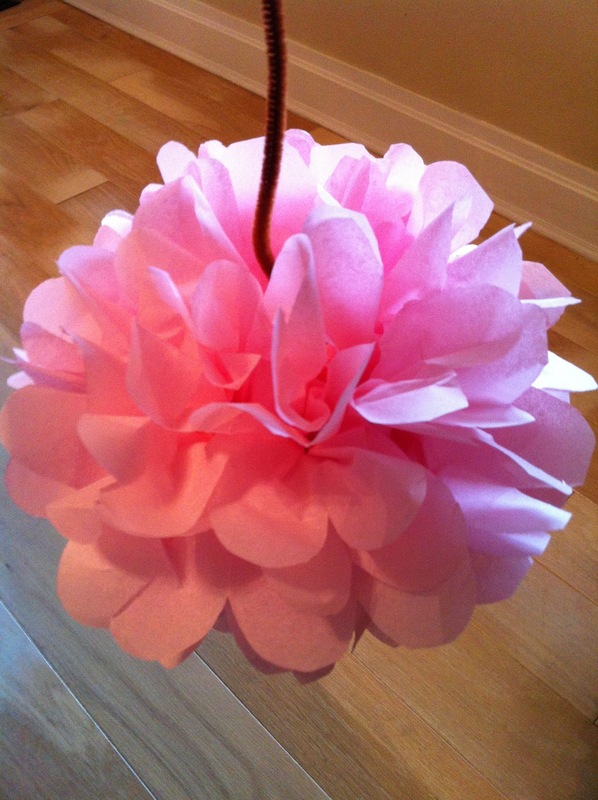 I’m starting to plan for my daughter’s birthday party in a couple months. 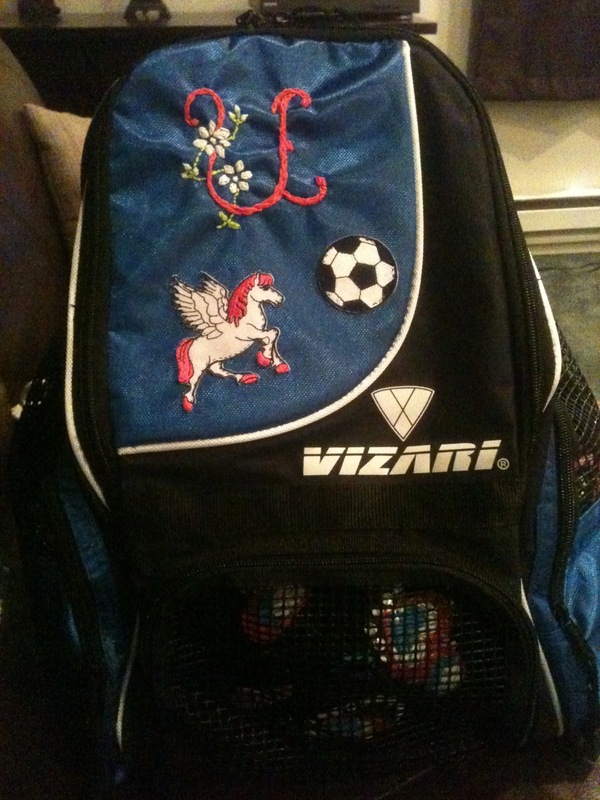 The theme had been chosen as Barbie Pegasus and colors are light pink, light blue and lavender. 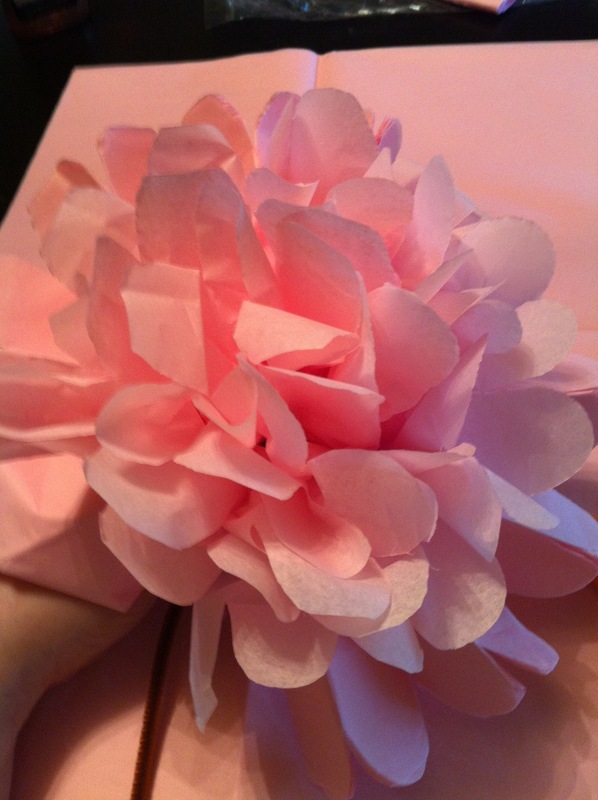 We will be using streamers and I’ve decided to make some beautiful Tissue Paper Flowers too. 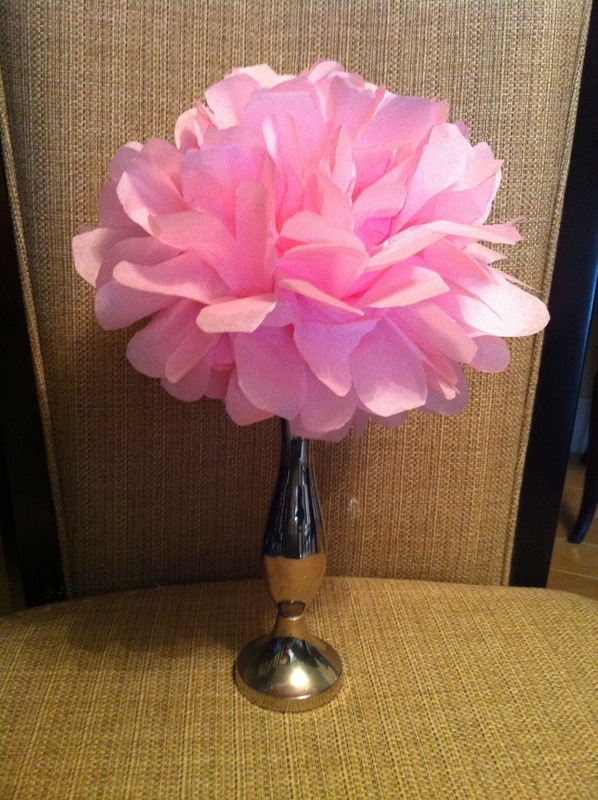 They are simple to make and look exquisite. 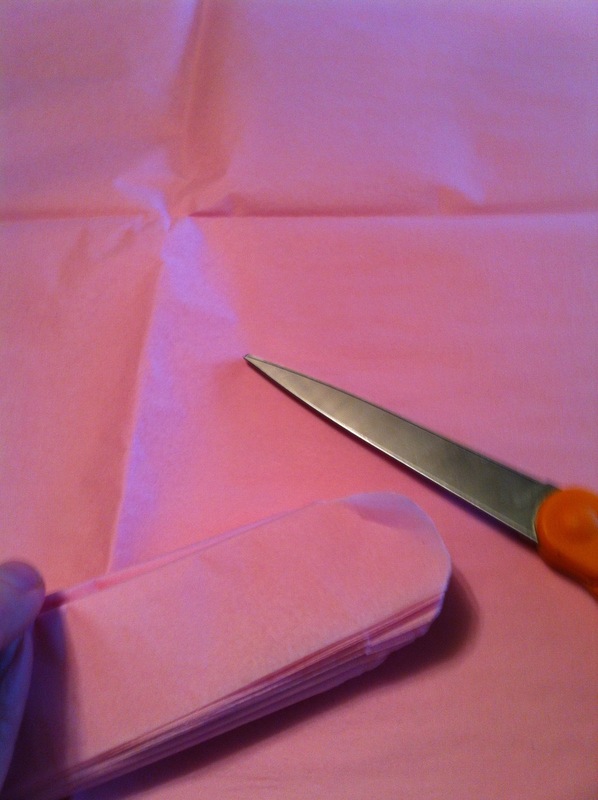 To make mine I bought 50 pages of light pink tissue paper in 15″x20″ size. 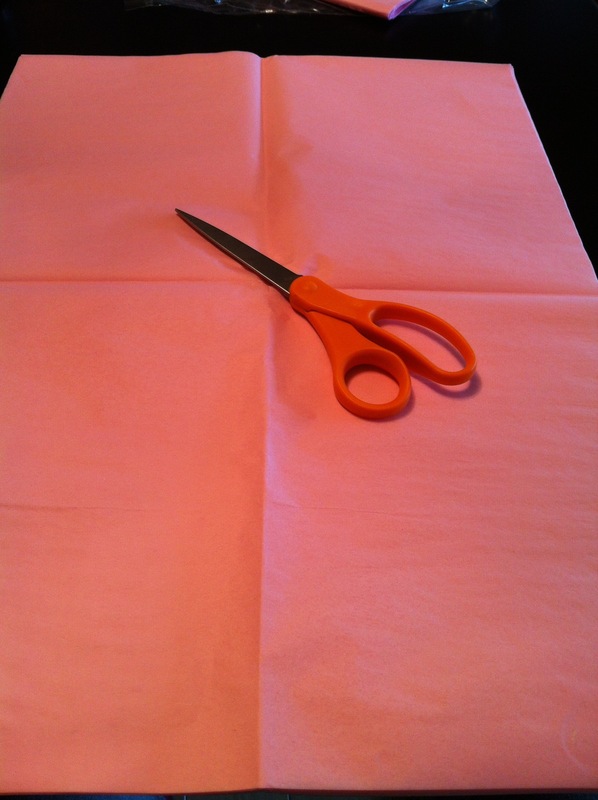 First I took 5 sheets and cut them in half so then I have 10 sheets measuring 10″x15″. 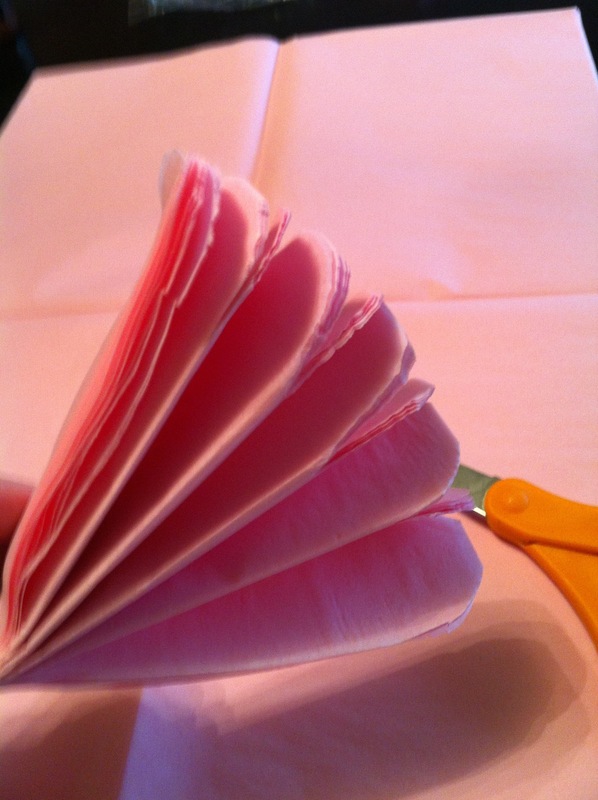 I stack them together neatly and then fold like an accordion fan. 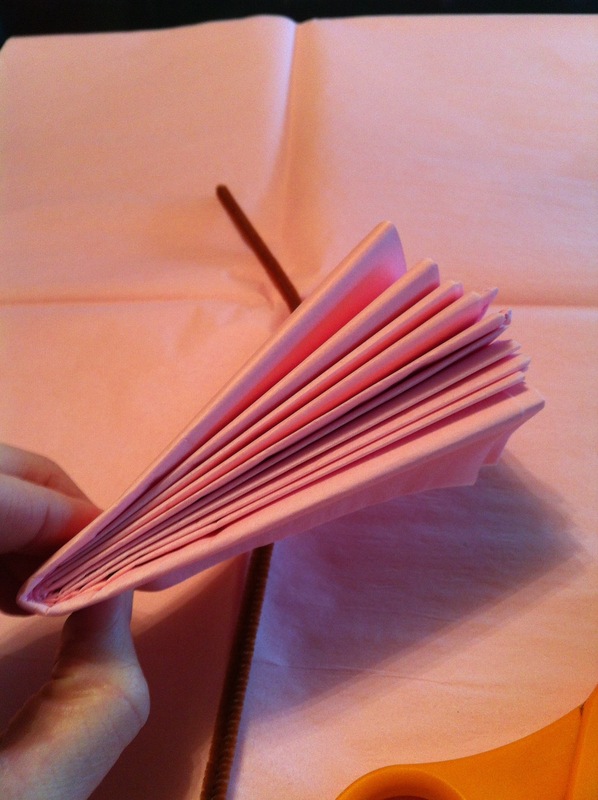 Make the folds about 1 inch. 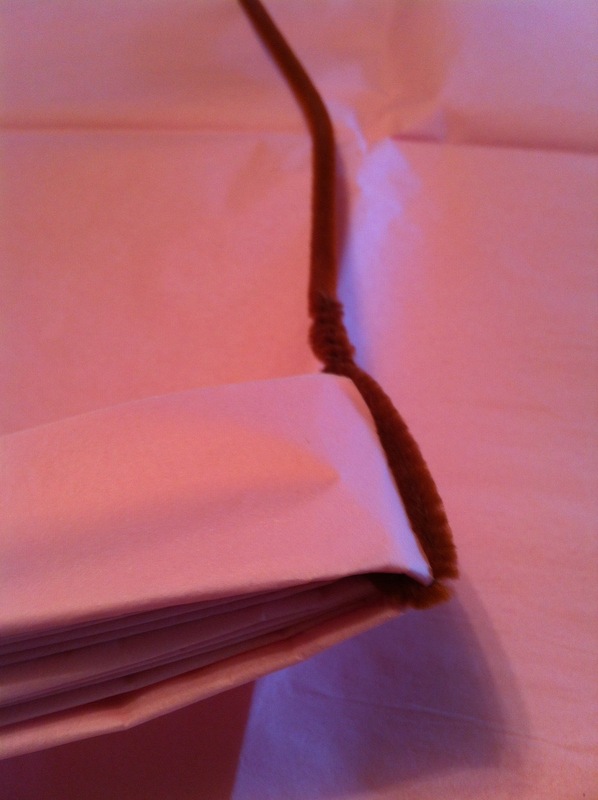 Next fold them in half and wrap a pipe cleaner around the middle and wrap it so it stays closed. 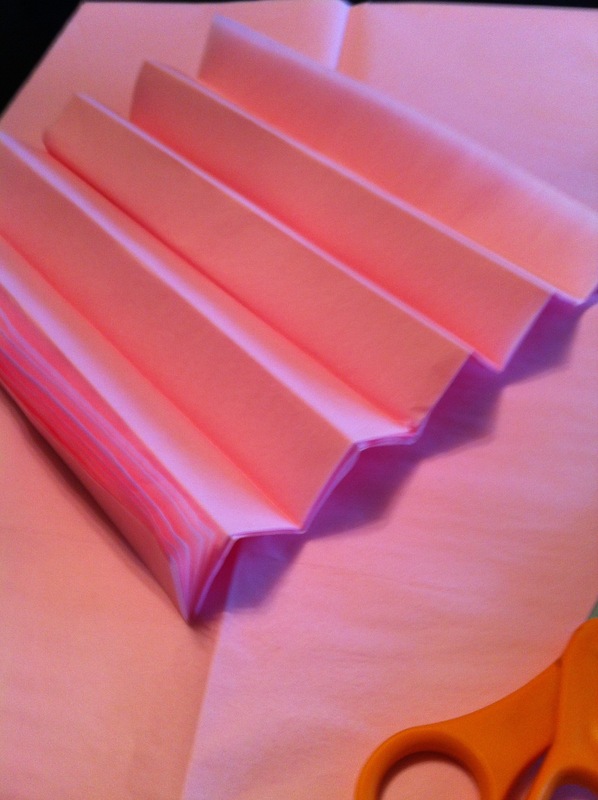 Then I cut the ends to rounded shapes. 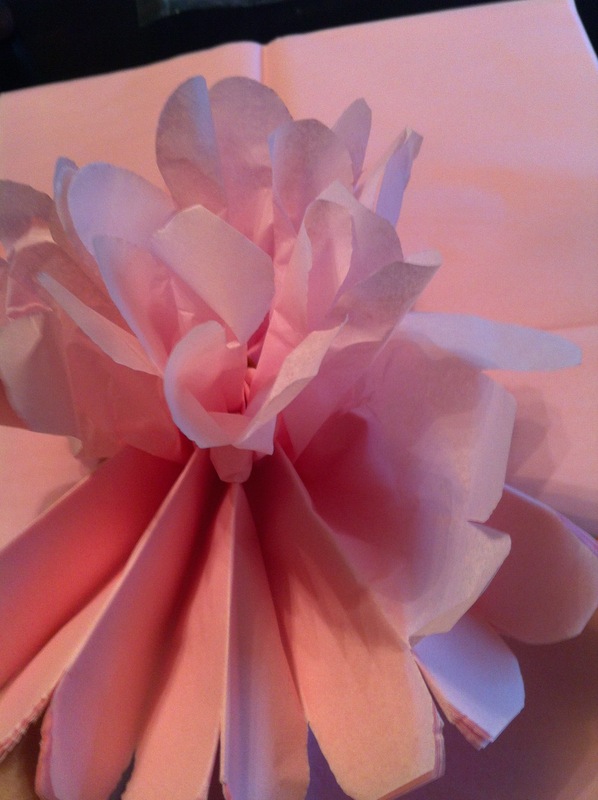 Then I was able to begin slowly lifting each sheet to the middle and continuing with each sheet making the flower completely full. 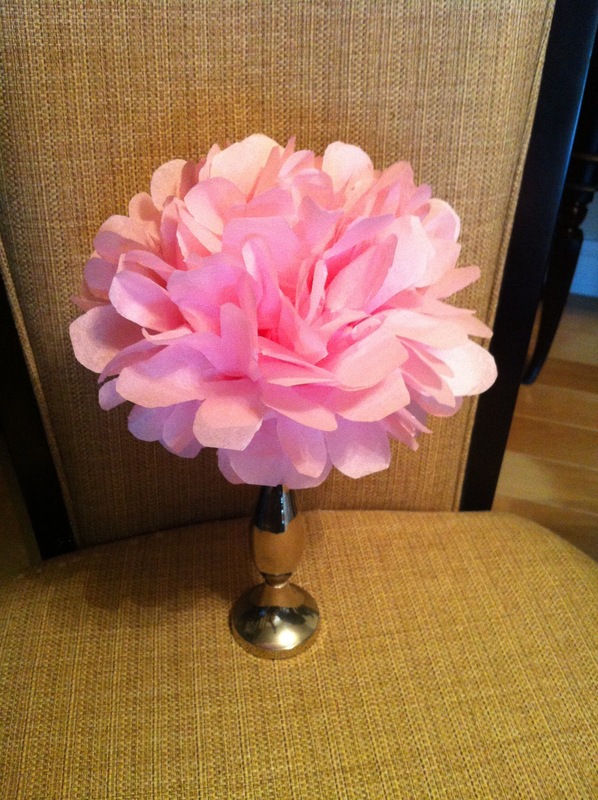 You can experiment with cutting different shapes on the ends for other flowers you make as well. 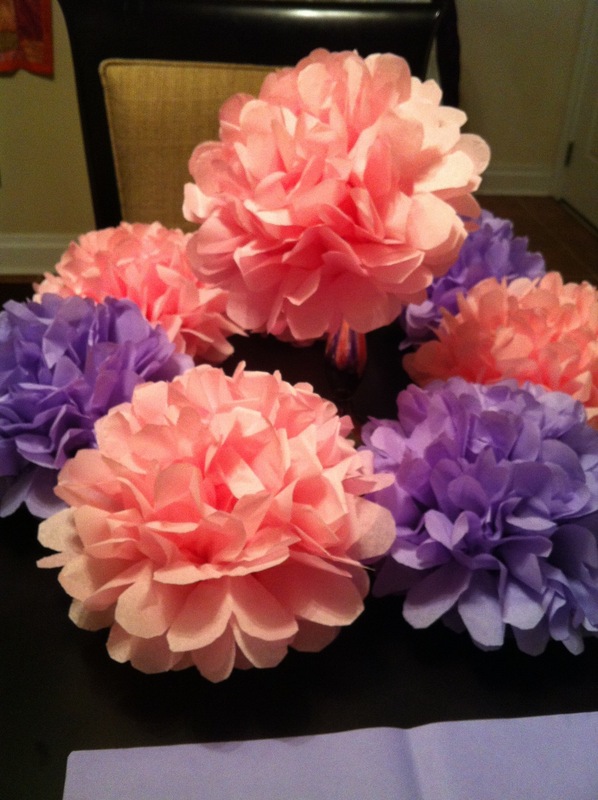 I plan on making light blue and lavender flowers too. 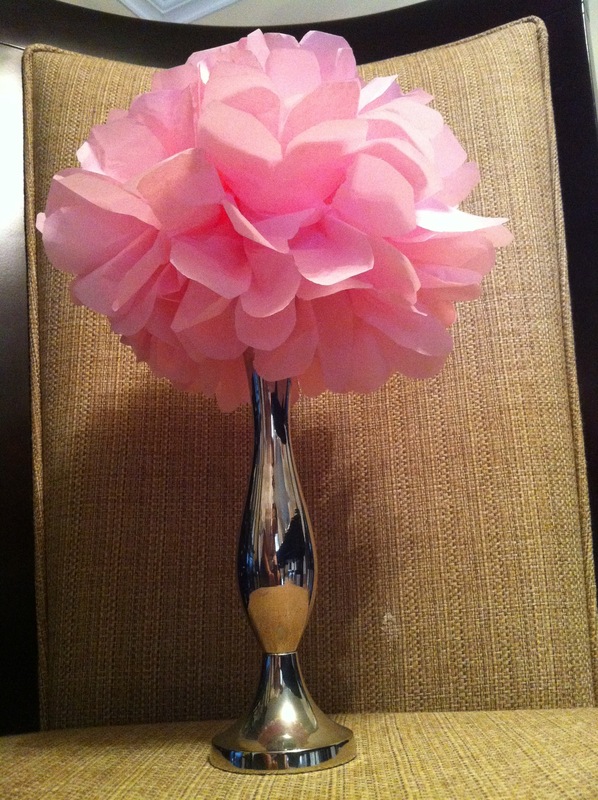 I may put some in vases and hang others with streamers. 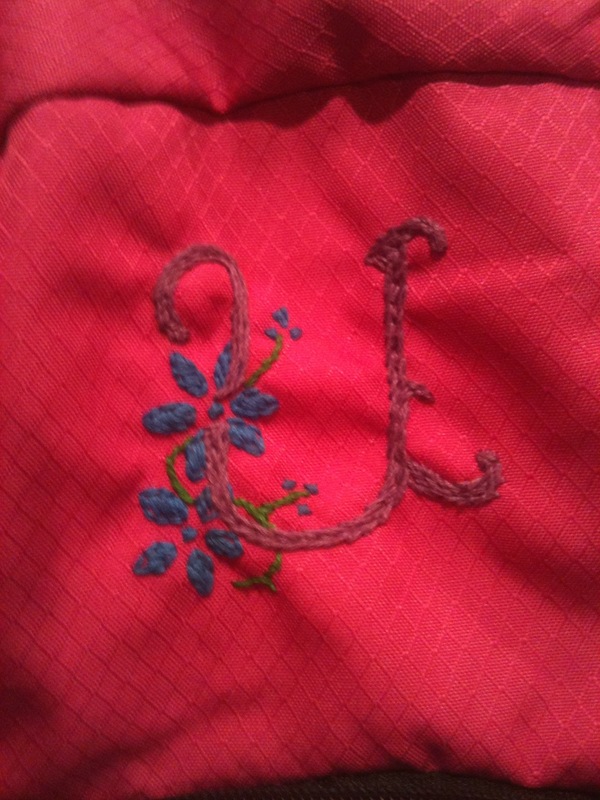 The embroidery of initials is almost a lost art except for far and few between or by high end store catalogs like Pottery Barn, LL Bean and Disney Store for their machine embroidery. 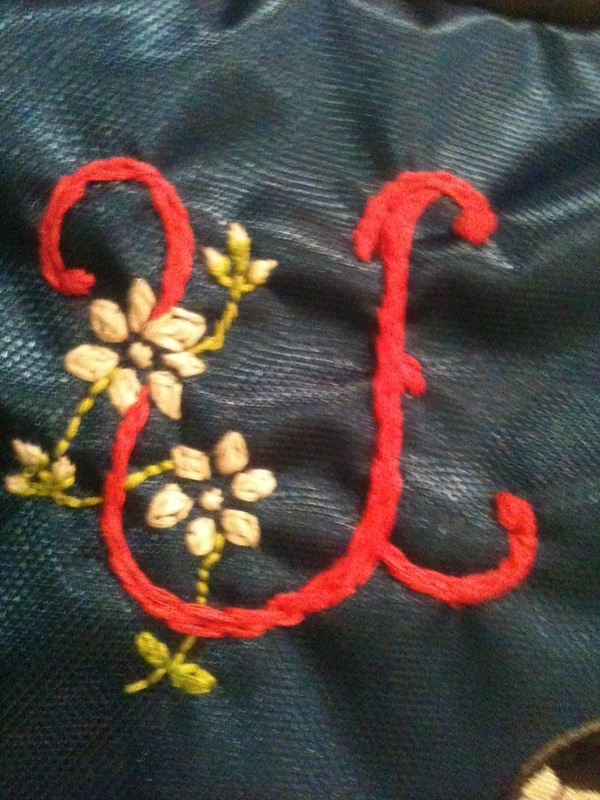 I much prefer the creative touch I can provide by embroidering by hand. 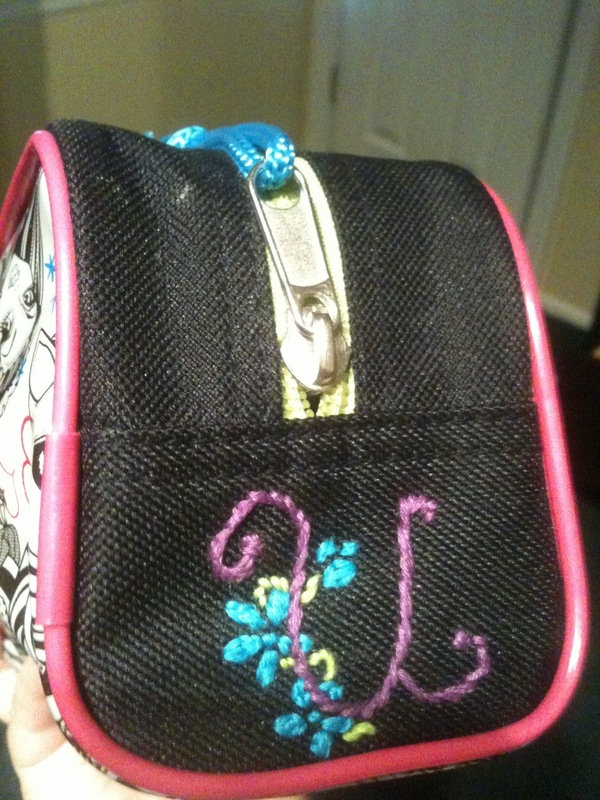 Really it is simple if you sew by hand you can purchase embroidery needles and floss or embroidery thread. 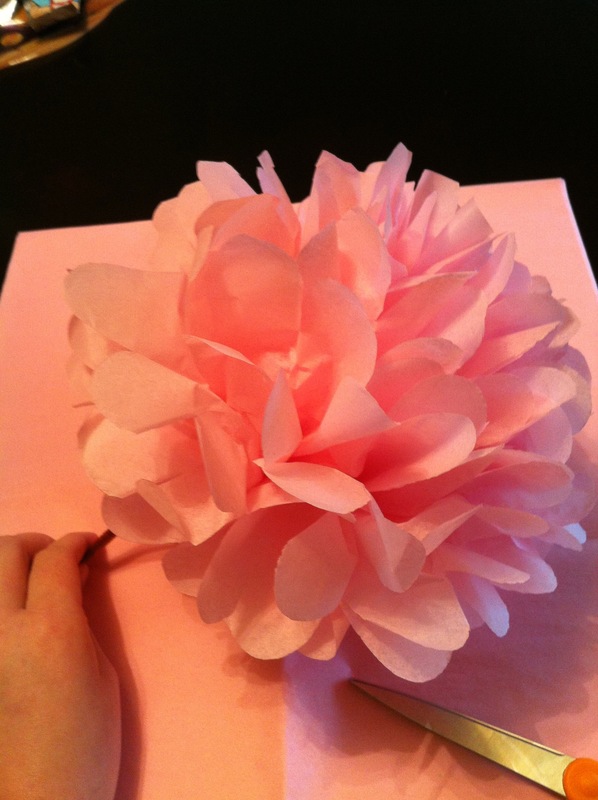 Also search online for the photo of which letters you need and you can copy on paper and then recreate and even give your own spin. 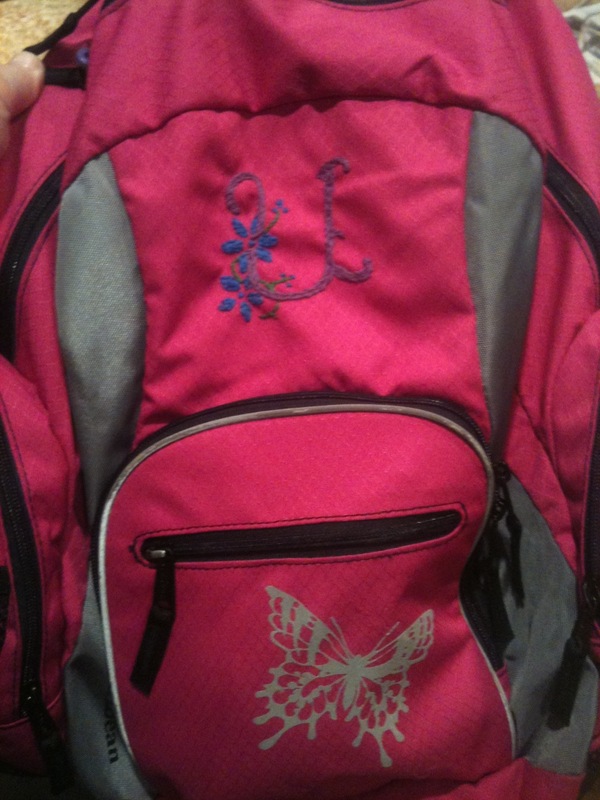 I like for my daughter to have her initial on all her bags for school and sports. 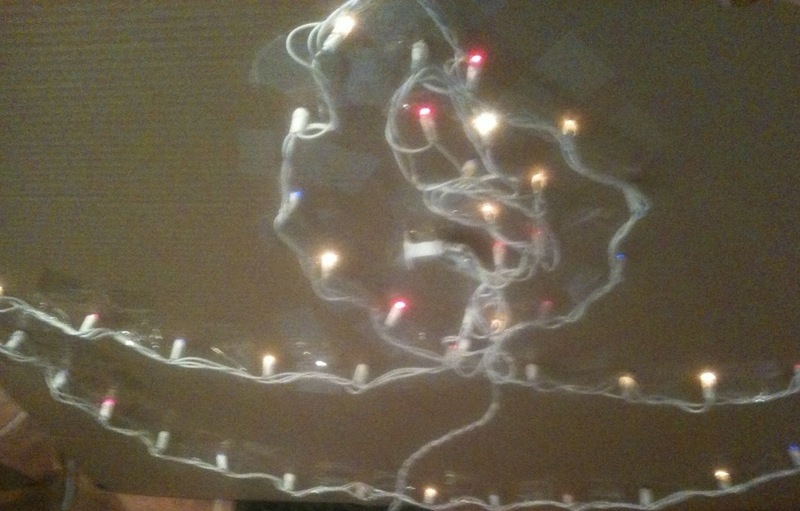 She loves it to for the design and being able to recognize her things instantly. 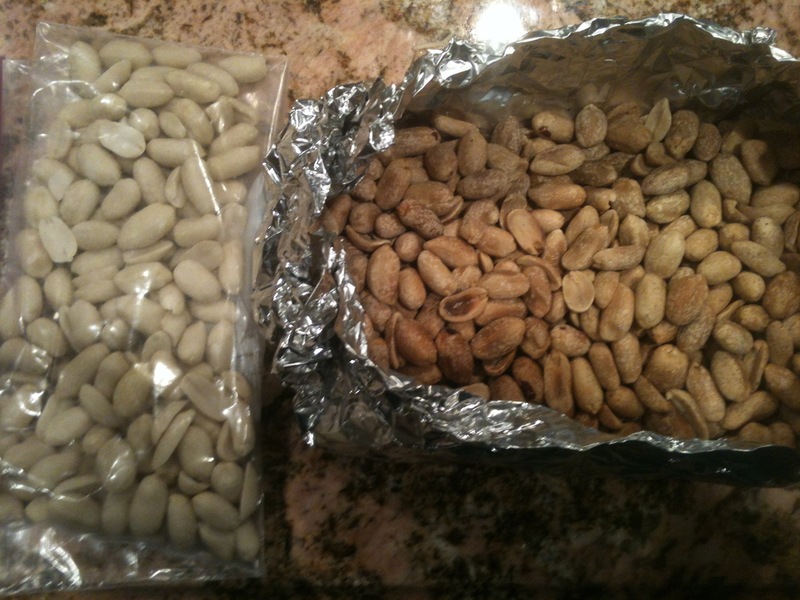 A very healthy snack which is inexpensive to make at home are roasted peanuts. You can make plain roasted peanuts, salted, sweet, sweet and salty, spicy, masala or garlic. You can also roast them in or out of the shell. 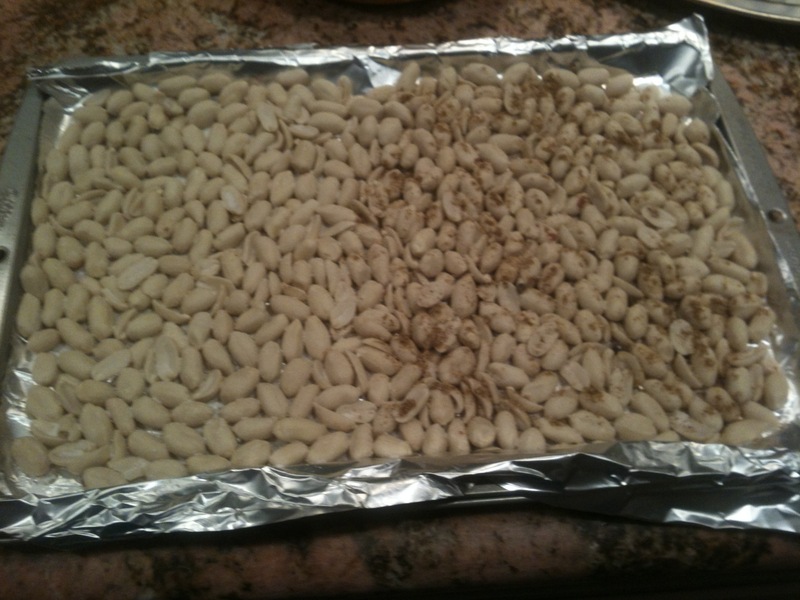 Put foil on baking sheet and spread a single layer of peanuts. 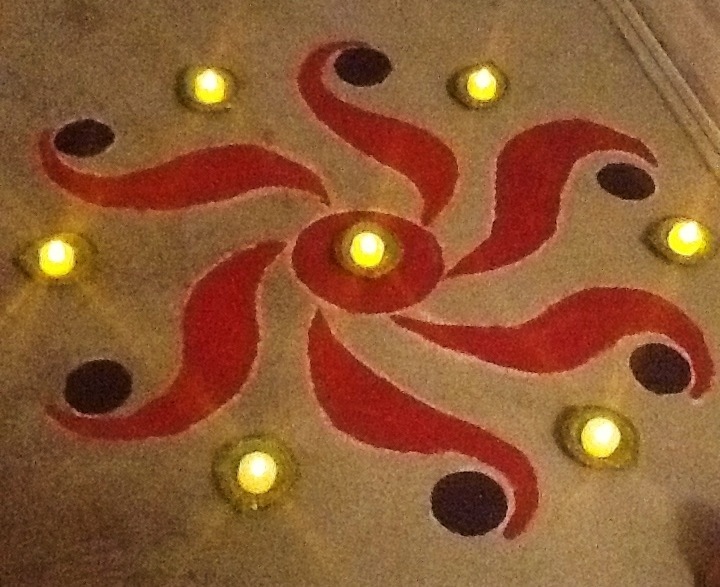 This year I have made a simple contemporary rangoli design of my own for Diwali. 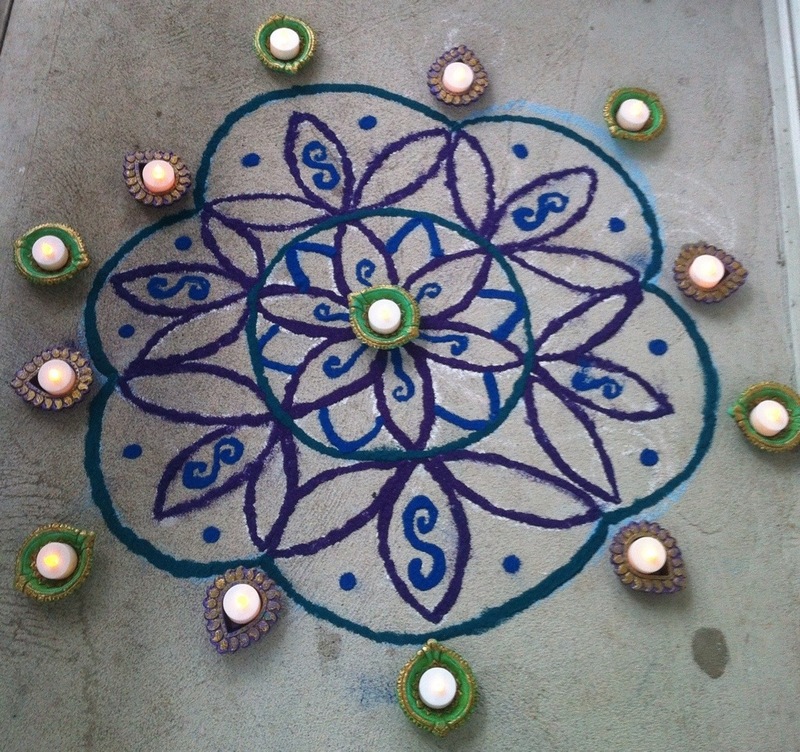 For those who are not familiar with making a rangoli, many things can be used for the design. 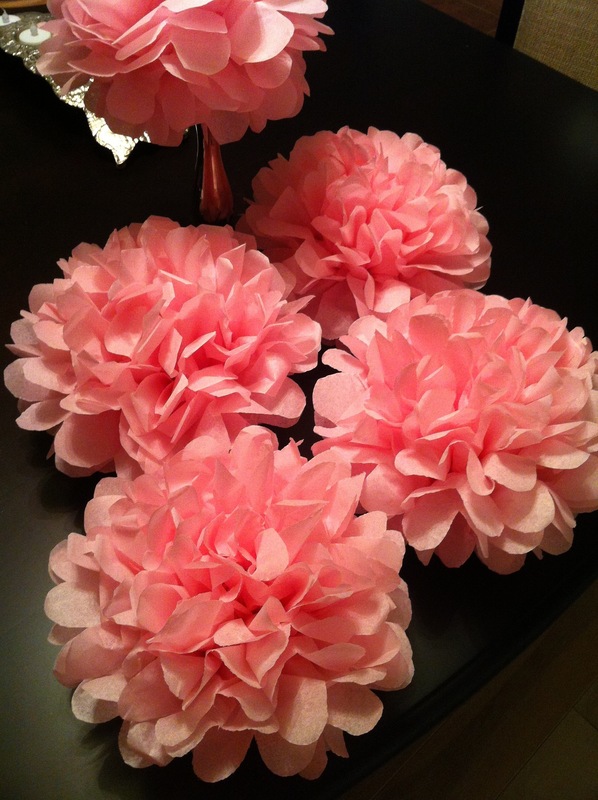 Great things to use are chalk, colored sugar or colored powders, flower petals from roses or marigolds etc. 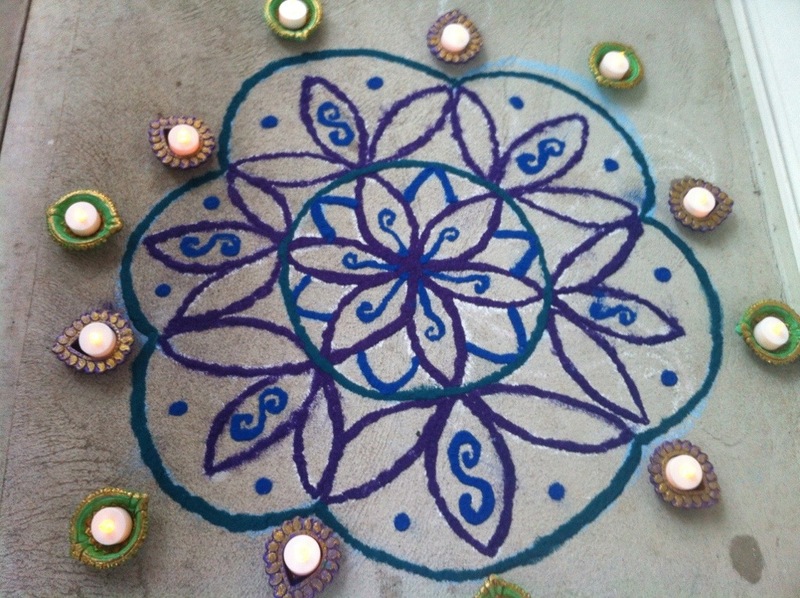 I drew my pattern with chalk and then used rangoli colors to fill in by hand. 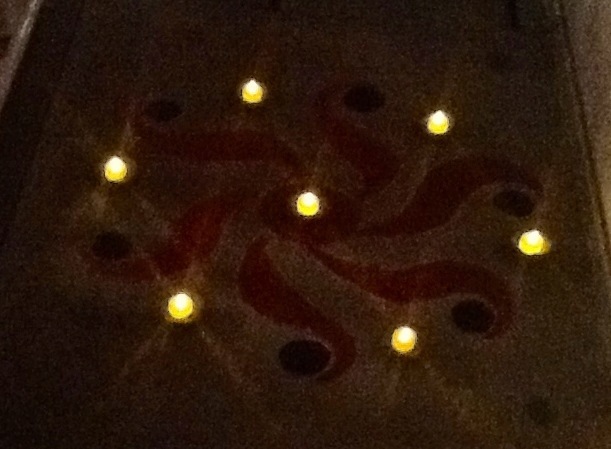 I used battery operated tea lights to avoid the danger and mess of oil and fire. 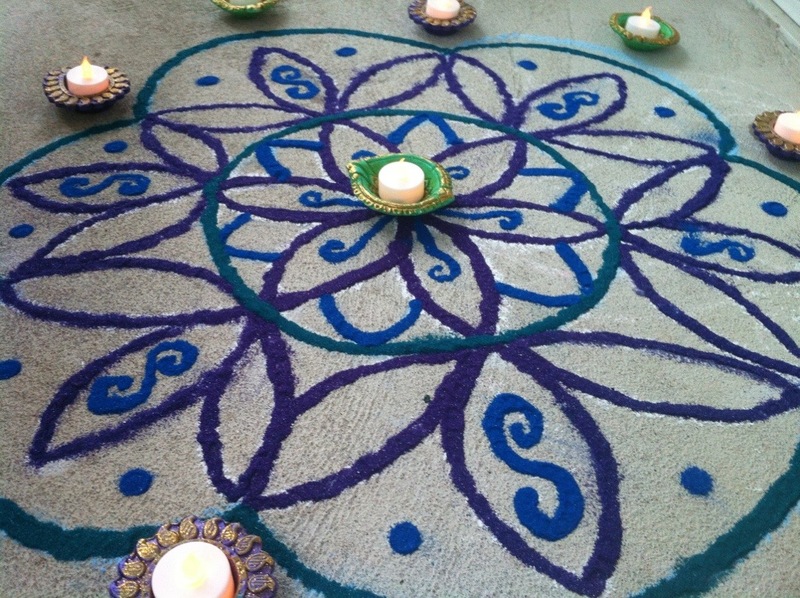 Happy Diwali to everyone and their families. 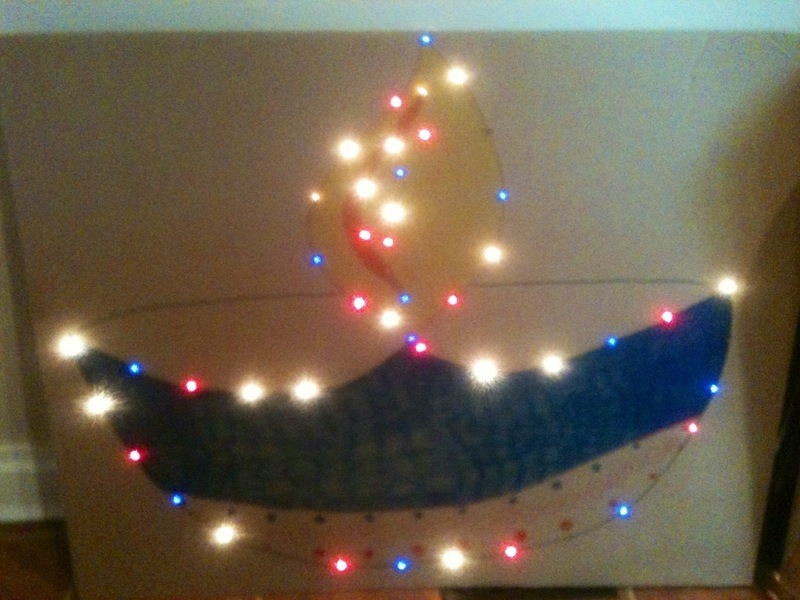 We are having a Diwali Celebration at my daughter’s school and I decided to make a large diya with lights as a decoration. 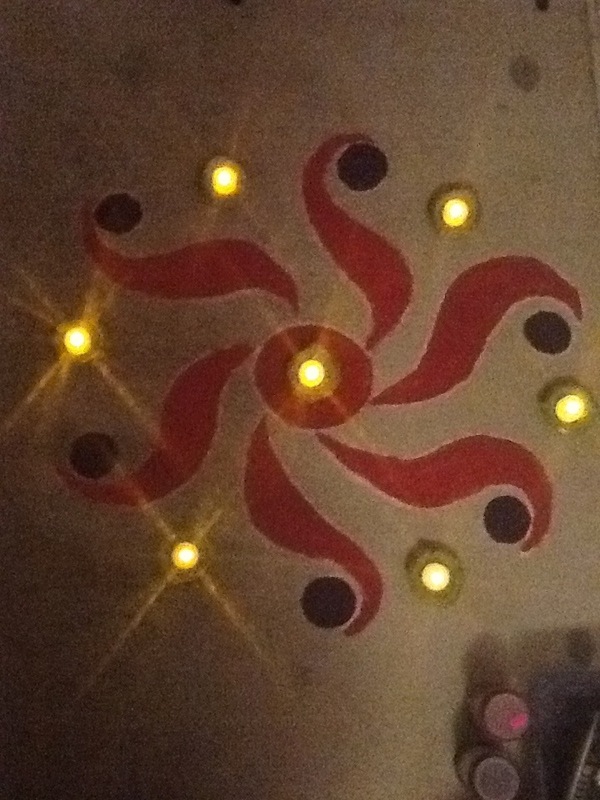 I used a huge piece of cardboard (free from Costco) and drew the diya design, then I poked holes with a sharp pencil for each of the lights on a strand of lights to show through. 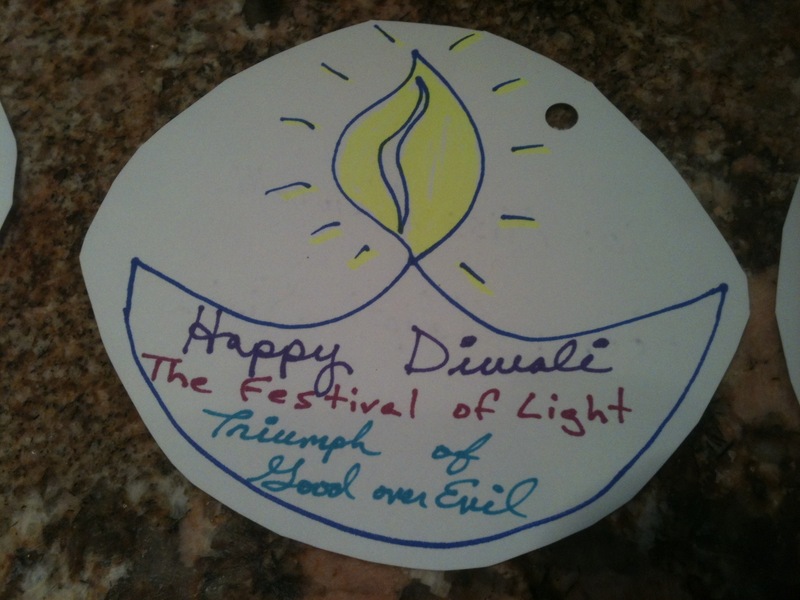 I taped the lights on the back and colored in the diya with markers. 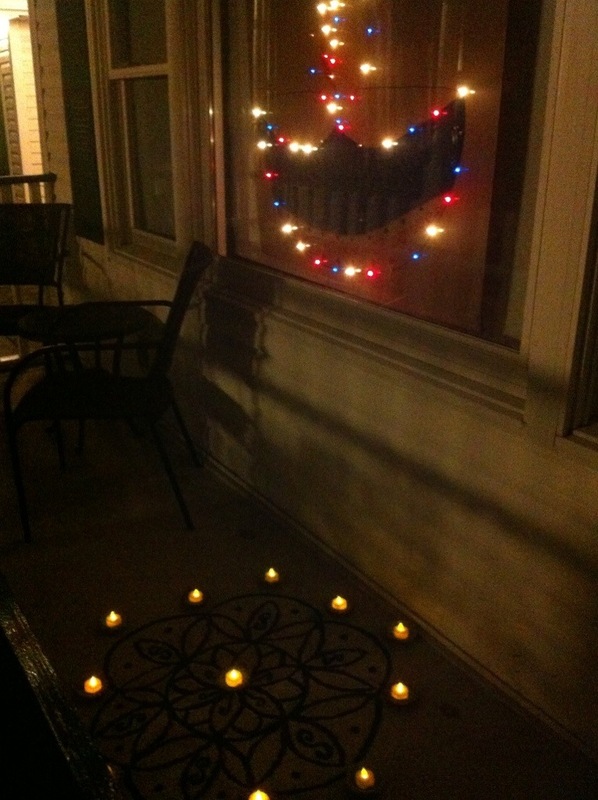 It came out cute and I will be displaying at the school and at home in the window for years to come. 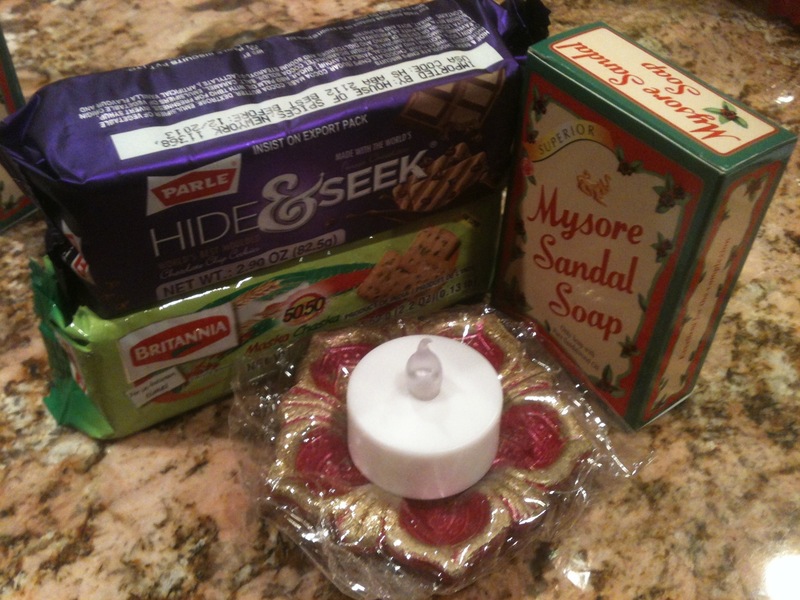 Diwali is quickly approaching and while I wished I had the time to come up with a more elaborate or homemade gift for teachers at my daughter’s school, I have just put together something simple that can be enjoyed as a little taste of India for her teachers. 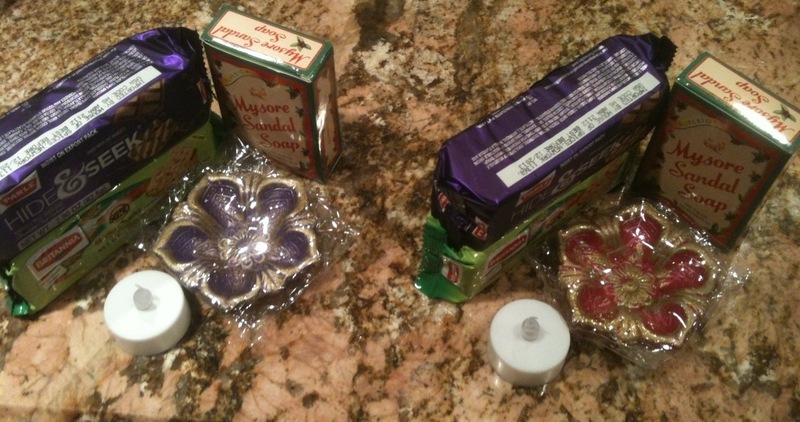 I thought this little grouping would be something that could be enjoyed. 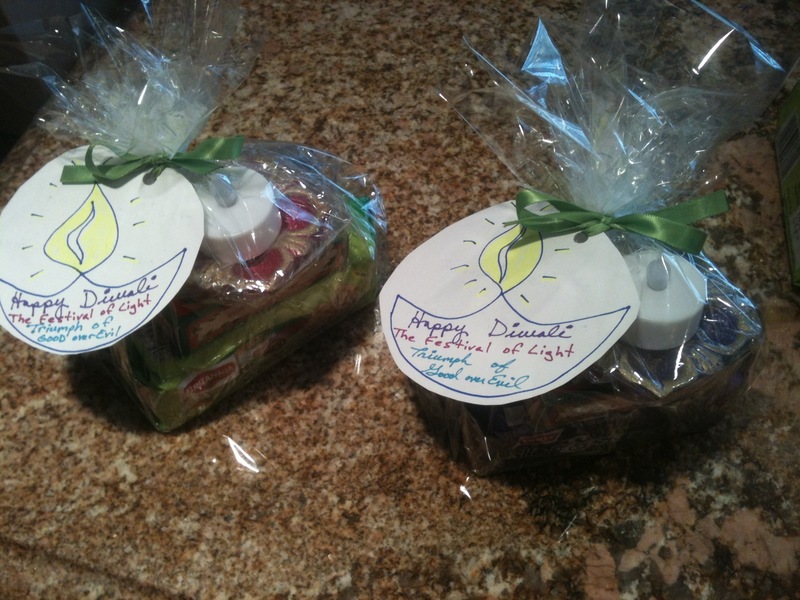 Hopefully they will like them. 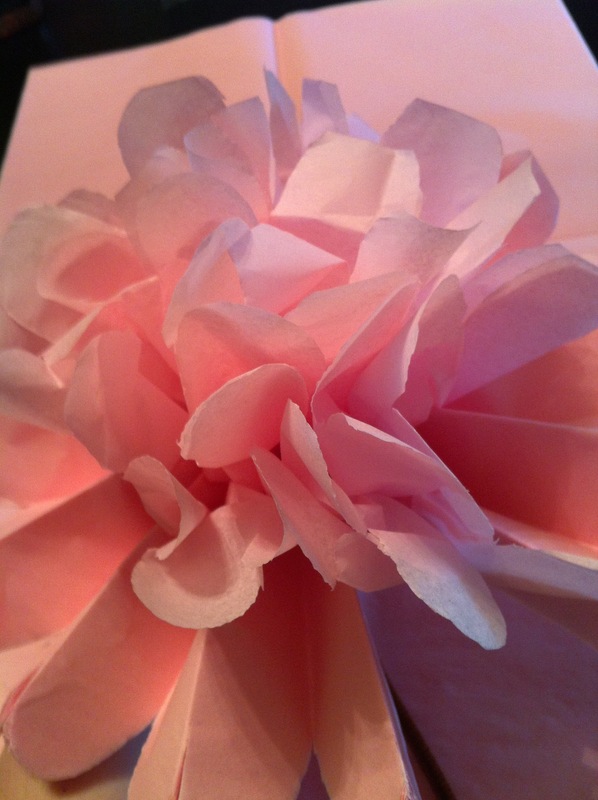 I will try to wrap decoratively or use a small gift bag for each set.